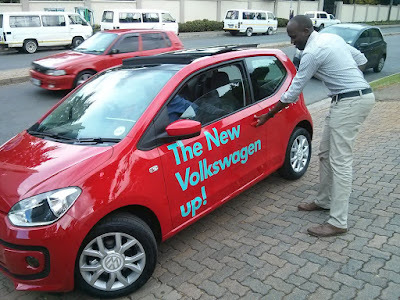 Uber regularly teams up with vehicle manufacturers in marketing stunts, like this free ride in Johannesburg in May 2015. On the opposite lane are public taxis (3 white vans) of the kind that are having their operating model challenged by technology based transport service operators like Uber. Every pundit in Kenya is writing on Uber, and I have joined the fray. Tom Makua keeps poking fun at how columnists use world events to draw business lessons. It is a foolproof way of looking like you know what you are saying - after all, you are drawing lessons from other people's failures, rather than been the one stuck with a failing strategy. A good thing with drawing lessons from failure is that people tend to have a better idea of what you are saying. If you write the same article before an issue arises, people will tend to ignore it. There's the possibility too that things might not end up the way you promise they will. In the past few weeks, Uber has irked other taxi players in Kenya. It is not clear what the reason is - Is it that Uber is charging far lower than they do, or that Uber is drawing their clients, or that Uber has a majority share of the consumer side of taxi business? What is clear is that the "traditional" players who have been operating in Nairobi do not like Uber. You would think it is an exaggeration stating so called "traditional" players are literally stuck in the stone age. They have however tried hard to erase any doubt in this statement by actually stoning their competitors. How apt. Uber is not even a year old in Kenya. They launched in July, 2015. They have however been so successful that almost every taxi operator that is not Uber appears pissed. They have managed to turn the industry upside down in only 6 months. Uber's international expansion began in 2012. 3 years later, they were in Nairobi. It is not typical for a Silicon Valley company to expand that fast to Nairobi. Kenyans, or rather, Nairobians, are typically used to being ignored by US companies, who dedicate resources to rolling out in more populated countries and cities, or ones where the economy is far larger than Kenya's. This is understandable. Kenya's economy is quite small, yet the regulations that tech companies have to face before rolling out here are not as few. It thus makes sense to focus on the Indias, Brazil, and other places first. Spain, with a population close to Kenya's, has an economy 20 times larger than Kenya's, despite Spain's reputation as a struggling economy in Europe! Looking at Google Trends, global news about Uber started picking up in 2014, with interest taking off around mid 2014. This means that a majority of Kenyans must have started hearing about Uber's activities in other countries about mid 2014. Did our "traditional" taxi drivers hear about Uber before it's arrival here? I'll assume it's highly unlikely. First, most of them did not have smartphones as recently as last year, hence were unlikely to be using the Internet as a source of news. Secondly, Mbugua explains the typical taxi operators day in Kenya here. It is clear that these guys resort to newspapers for their news. Now, one thing I'll tell you about Kenyan dailies, is that they give a blind eye to technology. Technology falls under business reporting, and their business reporting style means many technology stories do not meet the editor's cut. Either, they are foreign (Why is Uber in the US of interest to Kenyans? ), or they feel the stories are selling the company (Why write about why people love Uber, that's a free advertisement?) or they feel that many technology stories are irrelevant or too complex for most of their readers. My point? By the time a taxi driver read about Uber in Kenyan dailies, the company had been in operation here for more than 2 months. Furthermore, it was likely in a story with a headline such as "US taxi company invests KSh. 500 million in Kenya", with little background on the disruption (I had avoided this word, but I guess this is now unavoidable.) that Uber has caused to other taxi players in the US and elsewhere. Globalisation means a small, fast growing technology-based company in some other country can wreak havoc on the strategy of a large company, or an industry in a country on some other continent. Our news reporting is yet to largely wake up to this fact. We look too much inwards. We are yet to wake up to the fast pace of globalisation. My purpose of the bit above is to show how Uber caught Kenyan taxi operators napping. In addition to street taxi operators, Kenya has formal taxi companies, including and not limited to Delight Cabs, Pewin and Kenatco. The formal companies were in a better place to respond to the threat from Uber, assuming that they were aware of global ongoings in their industry. They would have downloaded the Uber app to have a look, sent company representatives to the UK to spend a week using Uber cabs, with the brief to come back and implement something similar. At the moment, such formal companies are still shielded from Uber by the virtue of corporates, who are a majority of their clients. However, the writing is on the wall. Uber has a business offering, billed monthly, and which gives businesses control over how employees can use the service. It should be remembered that corporates were still issuing employees with BlackBerries years after the iPhone was out. Then one day , they told employees that they can have iPhones. Change may be slow, but it was coming. At the same time, formal companies still have the advantage of competitive rates. Uber bills about Ksh. 60 per Kilometre, plus other fixed fees, while these local firms bill a comparable KSh. 60 - Ksh. 90 per kilometre. If they integrate technology into their way of doing things, they may have a good shot. Furthermore, mobile apps will allow them to expand their base beyond corporate customers. After all, Uber is not a taxi company. It merely provides a platform for select taxi operators it works with to efficiently pick up passengers, deliver stuff and more. The reason Uber is competitive is efficiency. Uber drivers run more trips per day than a typical taxi driver, most who usually have to wait till nightfall for clients. In Kenya, one Uber driver I talked to earns about KSh. 70,000 per month. A cook at one of Nairobi's busy, popular cafe's earns KSh. 25,000 per month. The comparatively high wages for Uber drivers is because they run more trips. Some are so busy that they have to take breaks and go offline at some point. Traditional taxi drivers, meanwhile, usually don't see a lot of demand during the day. See the difference technology can make. Additionally, by increasing utilisation of taxis and drivers, Uber has brought the cost of a taxi down. Rides that used to cost Ksh. 1,000 now cost as low as Ksh. 300, while those that typically cost KSh. 1,500 - KSh. 2,000 are now in the KSh. 1,000 range. The result is that people who never used to take taxis now take Ubers. Another thing, Kenyans love prepaid billing. 97 percent of mobile phone users are on pre-paid (pay as you go). Kenya Power, Kenya's electricity monopoly is rolling out pre-paid electricity meters, which in many places are preferred over their monthly-billed alternative. Uber lets riders see how much a taxi ride will cost them before taking one, and make a decision on whether to take an Uber or not. A typical non-Uber taxi ride involves approaching a taxi operator, getting quoted to twice to thrice the cost, and haggling down. Good luck attempting that on Saturday 4 AM after a pub crawl. There's also the issue of crime. Thieves have been known to pose as taxi operators, only to rob you later. Taxis are also known to run out of fuel, with the driver leaving you by the roadside as he dashes with a plastic container to the nearest petrol station. Sometimes, such issues happen in dangerous sections of the city. You (and your friends), alone in a stalled cab, in the dark, is a good setting for a real life horror story to later share with your friends. A side benefit of Uber is it has made it relatively safer for women to be taxi operators in Nairobi. Though few will dare to venture out at night and risk dealing with drunk passengers who won't keep their hands to themselves, day runs are typically safer. In case of an issue, Uber has a record of who the passenger was. Additionally, passenger ratings and destinations mean drivers can decide who to pick and who not to. Uber enables drivers and passengers to rate each other after a trip. Poorly rated passengers will have trouble getting picked up, especially when it is likely to be risky. Often overlooked is the amount of design that goes in the Uber app. The mobile application has been tested by human behaviour experts, and designed in such a way that you can download and register on the app in a few minutes, standing on a rainy street with no other taxis or matatus in sight. It doesn't take 5 minutes. Those who consider Uber as a last option can thus be quickly won over. Those who use the app are provided with enough information to encourage them to make a decision. It is just not an app, it is a well thought app. On the other side, Uber has its fair share of controversy, from the way it is perceived to unfairly treat drivers (especially in some countries) to more. This creates an opportunity for competitors, especially the firms I mentioned earlier. Uber's biggest competitor is China based Didi Kuaidi which also owns part of US based Lyft. These are yet to expand as much as Uber as done, and might take a while to be seen in Nairobi. Easy Taxi is Uber's main competitor in Nairobi, though suffers a number of operational hiccups - in the form of how it functions. It works well at times, but not as smoothly as Uber does. Other companies have come to the realisation of the threat caused by technology and globalisation. In Germany, the government is leading an initiative to have the country's manufacturers integrate technology into their products. Manufacturing accounts for 23% of the world's 4th largest economy. German manufacturers have come to the realisation that in the future, information will be of more value to companies compared to machines. A uniform maker in Kenya will pay once for a textile plant from Germany, but pay a monthly or annual fee for software than enables them to monitor the plant, adjust the plant on the go, or even get the plant to "talk" with the company's electricity generators, or other machines. The textile plant will report when a KSh. 500 bearing is wearing out, enabling the manufacturer to replace it in time, rather than be faced with a stalled plant a few weeks before schools open, with lost business starting at hundreds of thousands of shillings, for a KSh. 500 part. Rather than wait for US firms to provide these platforms, and relegate Germany to just manufacturing dumb machines, German manufacturers are now making their machines "intelligent". Bosch, a German manufacturer of car parts such as wipers, already manufactures rain sensors that adjust wipers according to the presence and amount of rain. Bosch is now testing brake peddles that vibrate based on input from vehicle collision detection systems, or navigation systems, enabling safer and fuel efficient driving. Audi, BMW and Daimler (Mercedes Benz) jointly purchased Here, a Google Maps competitor. Not only will the software provide navigation, but will come in handy in self driving cars, of which there is a race which includes three US firms - Google, Tesla and Uber again, who are looking at making taxis yet more efficient by making them self driving! Tesla, a car manufacturer that did not exist in 2000 (founded 2003) has updated their cars through a software update to be self driving on US highways, much in the same way smartphones get new software versions! Days later, one of these self driving cars was able to brake itself in time to avoid a head on collision that the driver could never have anticipated! Tesla is now a competitor to German's luxury car manufacturers, despite a huge backlog on orders. Tesla's waiting list is reported to be 3 years long. For businesses not in the car industry, it is time to adopt technology, not for the sake of technology, but to run the business more efficiently. Somewhere in the world, someone is already integrating technology in your line of business, and they may be here soon. Technology firms suffer from these issues too. 4 years ago, businesses bought servers and paid people to run them in order to have a functioning email system. Now, firms like NodeAfrica can have an email system running in the Internet by tomorrow, at a low monthly fee, without the need of purchasing servers, or even hiring IT staff. Irrespective of your role, and whatever industry you are in, you will need to keep in touch with all sorts of development in your industry, especially on how technology is being integrated in your industry. It is time too to get acting. Find out the small ways you can apply technology to your industry today. A website that your customers hate is not a fool proof strategy. Also beware of technology ventures that despite being costly, may end up not achieving much. Mobile apps have turned to be a big fad. Many firms will get along fine with a mobile website, which is easier and more affordable in terms of maintenance. Mobile apps tend to make sense where there is a function that is carried out repeatedly. Furthermore, a mobile site is easier to change, and enables you to learn a lot about how your consumers interact with you before investing in a mobile app, that is harder and costlier to modify. This is just an example. Collecting data from all your operations and analysing it can give insights on your business. If you are in any doubt that we are in an information age, the biggest threat to government today is the alleged "misuse of a telecommunication device", for which many bloggers in Kenya have been charged with. Their offence? Sharing information that someone did not like. Our politicians understand the power of information. Does your business understand?